'I remember that this initiative started out when a group of mothers had to solve the problem of not having an option of leaving their children with someone while working away from home', says Sonia Talavera, who's now one of the participant parents of the family strengthening and community development programme in Estelí in Nicaragua. Like Sonia, other mothers also heard about SOS Children's Villages and its community programmes to help working mothers and fathers with the daily care of their children, so they organised themselves and paid a visit to the SOS Social Center in Estelí Este. 'We introduced ourselves to the co-workers and the director of the SOS Social Center explaining our request to them. We, the whole community, wanted to be part of the programme and they not only listened to us but also accepted our suggestion immediately…we couldn't believe it!' said Sonia smilingly. Both parents and SOS co-workers prepared a list of necessary elements to fall back on for making the commitment of working and developing together come true. Most details were covered for, but one big part was missing. They didn't have a house for the programme and for taking care of their children, and without this, the initiative was not able to gain momentum. The whole group of mothers started an exhausting search for houses up for rent, taking into account their very low incomes; most of the options were out of range. It took several days, but finally they found the perfect place, small, but safe, with electricity, clean water, enough space for the children to do their homework and play, affordable and not far from their homes. Without losing any more time, they organised a meeting with the family committee and took the decision of giving 50 Córdobas (app. 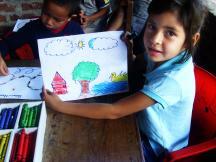 1.6 euros/US$ 2.23) monthly each to cover for the rent of the house and care for their 25 children. They named the community house 'Pinolerito' and on 12 February 2010, the mothers celebrated four years since its inception. 'It's an everyday effort we all have to put in so the money for the rent of the house is there, but we feel sincerely committed to our children. Now, we can work even better knowing our sons and daughters are cared for in a good place, where they are safe, happy and healthy, that's our daily inspiration'.